It’s hard to believe it’s been ten years since Raegan Moya-Jones introduced the first muslin swaddle outside of Australia. It all started with the birth of Raegan’s first child Anais (pronounced UH-nay) in 2003. Raegan grew up in Australia with the time-honored tradition of swaddling babies with cotton muslin, so of course she began searching for these breathable wraps after she gave birth in the States. But much to her surprise, not only could she not find them anywhere, but she didn’t feel any of the options that were available were right for swaddling. Inventing by way of necessity, Raegan launched the original muslin swaddle blanket in the US in 2006. With their breathability, versatility and modern aesthetic, aden + anais muslin swaddle blankets instantly resonated with American parents and quickly became a must-have among A-list celebrities like Julia Roberts, Adam Sandler and Naomi Watts to name a few. Inspired (and tickled!) 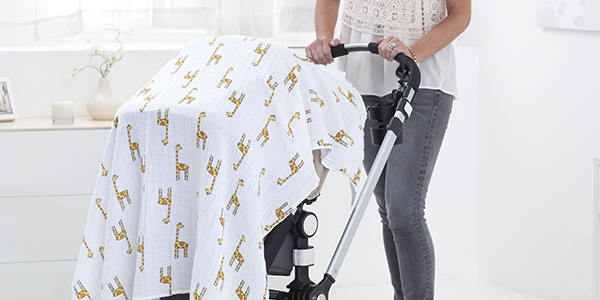 by the frequent aden + anais swaddle-sightings in US Weekly and the like, we launched the Paparazzi print. In honor of our 10th anniversary, we are bringing back this beloved print in a limited-edition collection. With its black and white palette—a color scheme unheard of in the baby market back then—Paparazzi is a testament to the brand’s trailblazing beginnings and the perfect way to commemorate this major milestone.